ECR COMMAND READY is a big bodied beautiful red cow from the EL COYOTE RANCH. Her Sire is HIDALGO ECR who is out of HUNTS COMMAND RESPECT and his Dam is ECR AMIGOS SPECIAL. Her Dam is ECR PRIMED & READY out of PRIME TIME ECR & ECR READY COACH. This cow is going to be very exciting to watch. 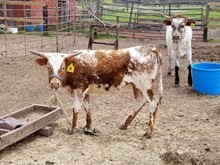 She has a gorgeous red & white flashy heifer calf that was born 05/29/2018 out of STOCKMAN BCB! Both heifer and mom are an exciting addition to our herd at LONG M RANCH! She was confirmed pregnant by palpation, approx. 30 days in November, to WS ELEVATION!